These memorials are now inside the St Andrew's Erskine Greenknowe Parish Church at OS Map Ref: NY 193 665 where they were moved in 1974 on closure of Erskine Church. Apologies for the 'keystoning' in the photos, these plaques are at least 10 feet up on the wall in the entrance and I had to use a step ladder to get even these shots. On a whim (because it is an unusual name), I looked up Schoolar. Despite appearing on a WW2 memorial, SNWM has him as dying in 1948 in Palestine! Predicably, he does not appear on CWGC at all. I guess that means that he really should not be on a WW2 memorial? PTE. FRANK BEATTIE, 1st K.O.S.B. Francis (Frank) William Beattie – age 41 – Private (18337) "A" Company, 1st Battalion, King's Own Scottish Borderers. Frank was employed at Newbie Fisheries when he enlisted. He joined his battalion at Gallipoli in August 1915. The battalion moved from Egypt to France in April 1916 and he was wounded there. He returned to France only to be fatally wounded. Born 1877 at Riddingdyke, Cummertrees as Francis William Beattie. Son of James and Elizabeth Marion (Nicholson) Beattie. Husband of Elizabeth (Shennan) Beattie of Newbie Barns, Annan who he married in 1898 in Annan. Died of Wounds on 30 April 1917 and buried in Etaples Military Cemetery, France. 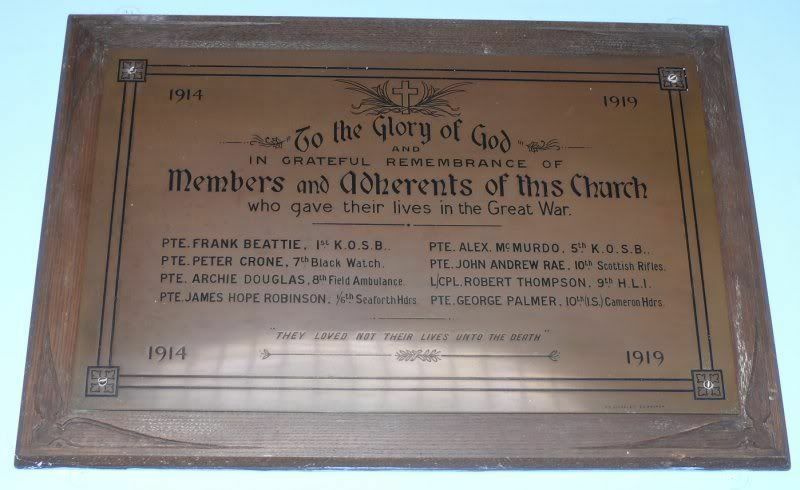 Also named on the Annan War Memorial as F. W. Beattie, on the Cummertrees Parish War Memorial and on a stained glass window now in St Andrews Greenknowe Erskine Parish Church as William Beattie. PTE. PETER CRONE, 7th Black Watch. Peter served his apprenticeship as a grocer in Annan. He enlisted at Perth as Private (4394) in the 1/6th Black Watch in 1916. Born 1881 in Annan as Peter Cron. Son of the late Robina (Bell) Cron and of William Cron of Annan. Killed in Action on 20 November 1917 and buried in Ribecourt Road Cemetery, Trescault, France. Also named on the Annan War Memorial. PTE. ARCHIE DOUGLAS, 8th Field Ambulance. Archibald Douglas – age 25 – Private (30508) 8th Field Ambulance, Royal Army Medical Corps. Archibald was educated at Annan Academy and served his apprenticeship in the offices at Provost Mills in Annan before he emigrated to Australia. He returned and worked for a potato merchant in Annan, in Newcastle and in the Midlands before he enlisted in August 1914. He joined the 63rd Field Ambulance, arrived in Rouen in June 1915 and then joined the 8th FA. Born 1892 in Annan. Son of Bailie Ebenezer Douglas and Elizabeth Hobkirk (Hammond) Douglas of 2 Church Street, Annan. Killed in Action on 3 May 1917 and buried in Tilloy British Cemetery, Tilloy-Les-Mofflaines, France. Also named on the Annan War Memorial and on the Annan Academy memorial. PTE. JAMES HOPE ROBINSON, 1/6th Seaforth Hdrs. Also named on the Annan War Memorial, on the Annan Academy memorial, on the Sedbergh School memorial and on the Commercial Bank of Scotland memorial in the RBS branch in St. Andrew's Square, Edinburgh. PTE. ALEX. McMURDO, 5th K.O.S.B. Alexander McMurdo – age 44 – Private (1869) 1/5th (Dumfries and Galloway) Battalion, King's Own Scottish Borderers. Alexander had been a regular soldier as Private (5791) with the 2nd Gordon Highlanders and had served in the South African War where he was wounded in October 1899. He was the janitor at the Annan and District Infectious Diseases Hospital when he enlisted in August 1914 and he landed with his battalion at Gallipoli in June 1915 but was killed at the battle at Achi Baba Nullah. Born 1871 in Maxwelltown, Troqueer, Kirkcudbrightshire. Son of Janet McMurdo of 18 King Street, Maxwelltown. Husband of Maggie (McIver) McMurdo of 2 Lawson's Court, Annan who he married in 1906 in Terregles, Kirkcudbrightshire. PTE. JOHN ANDREW RAE, 10th Scottish Rifles. John was educated at Annan Academy and had just completed his apprenticeship at the British Linen Bank in Annan when he enlisted in February 1917. He joined his battalion in France at the beginning of August but was wounded three weeks later and died on a hospital train on his way to hospital in Rouen. Born 1898 in Annan. Son of Thomas McLean Rae and Charlotte (Bell) Rae of 15 Scott's Street, Annan. Died of Wounds on 22 August 1917 and buried in St. Sever Cemetery Extension, Rouen, France. Also named on the Annan War Memorial, on the Annan Academy memorial and on the British Linen Bank memorial in St. Andrews Square, Edinburgh. L/CPL. ROBERT THOMPSON, 9th H.L.I. Robert Thompson – age 23 – Corporal (331251) 1/9th (Glasgow Highlanders) Battalion, Highland Light Infantry. Robert was educated at Annan Academy and served his apprenticeship as a draper in his father's business in Annan before securing a position with Messrs Macdonald Ltd. Drapers, in Glasgow. He enlisted there in 1914 but had only been in France for four months when he was wounded on 14 September 1917. He was evacuated to hospital in Poole, Dorset but required another operation and was transferred to the military hospital in the former Mont Dore Hotel in Bournemouth, Hampshire where he died. Born 1894 in Annan. Son of George and Agnes (Latimer) Thompson of 30 Charles Street, Annan. PTE. GEORGE PALMER 10th (LS) Cameron Hdrs. George Palmer – age 29 – Private (225779) 10th Battalion, Cameron Highlanders. George was a storeman at a grocers in Annan when he enlisted as Private (239) in the 1/3rd Scottish Horse Yeomanry. In August 1915 they sailed for Malta and were re-equipped as infantry for service at Gallipoli and they landed at landed at Suvla Bay in September. George then served in Egypt where his unit provided a company to the Lovat’s Scouts which was then forming the 10th Cameron Highlanders. He moved with his new battalion to Salonica in northern Greece in October 1916. Born 1888 in Annan. Son of the late James and Marion (Little) Palmer of Ivy Cottage, Annan. Brother of David Palmer of Ivy Cottage, Carlisle Road, Annan. Killed in Action on 25 October 1917 and buried in Struma Military Cemetery, Greece. SURG. LT. W. GRAHAM CUTHBERTSON, R.N.V.R. William was educated at Annan Academy and at Daniel Stewart's College in Edinburgh before attending Edinburgh University. He graduated M.B. & Ch.B. in July 1939 before taking up posts at St. Luke's Hospital in Bradford. He was commissioned in April 1940 and served off Africa, Aden, India and in the Mediterranean. The destroyer “Dainty” had sailed on a patrol from Tobruk in Libya but was attacked by a German Heinkel 111 aircraft whose bomb caused a magazine explosion. Survivors were taken off by HMS Hastie before the “Dainty” sank. Also named on the Annan War Memorial, on the Edinburgh University Roll of Honour and on the Old College War Memorial, and on a footbridge over the River Annan. PTE. S. A. JOHNSTONE. Seaforth Highlanders. Samuel Anderson Johnstone – age 26 – Private (3194345) 2nd Battalion, Seaforth Highlanders. Samuel had served his apprenticeship as a painter in Annan and was involved with the Life Boys and Boys Brigade in the town. Born 1916 in Annan. Son of Mary Elizabeth Johnstone. Grandson of Jessie Douglas Johnstone of Lady Street, Annan. Missing in Action between 24 and 25 October 1942 and named on the Alamein Memorial, Egypt. PTE. ARCHIBALD W. H. SCHOOLAR, K.O.S.B. Not listed by CWGC - see Paul's note above. Archibald William Schoolar – age 20 – Private (14157419) 1st Battalion, King's Own Scottish Borderers. Archibald was killed on the Jerusalem/Haifa Road during a terrorist attack. Born 1928 in Annan. Son of James and Jane (Kerr) Schooler of 10 Thorburn Crescent, Annan. Killed on Active Service on 11 March 1948 and buried in Ramleh War Cemetery, Israel. Also named on the Annan War Memorial and on the Armed Forces Memorial in Staffordshire. SERG. PILOT HARRY TAYLOR, R.A.F. Harry Taylor – age 25 – Sergeant/Pilot (1260918) 115 Squadron, Bomber Command, Royal Air Force Volunteer Reserve. Harry was educated at Annan Academy before serving his apprenticeship in the Royal Bank of Scotland in Annan. He was on the staff of the office in London when he enlisted in 1940. Harry's Wellington Bomber took off from RAF Marham in Norfolk for a raid on Essen but was shot down near Goch on the Dutch/German border. The crew were buried in Uedem Civil Cemetery but were re-interred in November 1946. Born 1916 in Annan. Son of Harry and Jean Whyte (Gibson) Taylor of Blythswood, Annan. Killed in Action on 27 March 1942 and buried in Reichswald Forest War Cemetery, Germany. Also named on the Annan War Memorial and in the RBS Book of Remembrance.